With all the options you could choose, shopping for the best push lawn mowers can be confusing. This article will help you decide which features work best for you. There are a lot of things to consider when buying push lawn mowers, and not all of them are obvious. Our guide below should help you make the right choice for your needs. 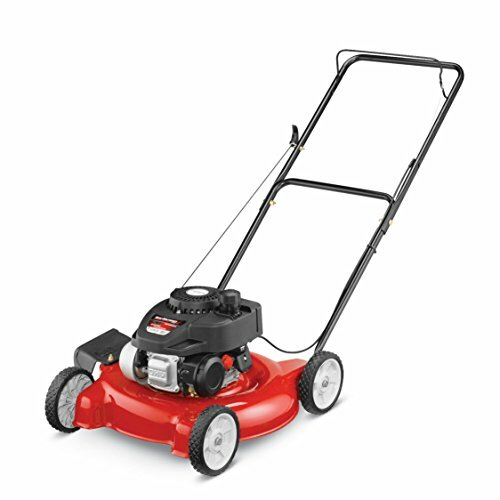 Push mowers – are for yards that are flat and less than 1/2 acre, and ideal if you want a quiet lawn mower that won’t wake up the neighbours on a Sunday morning! If there are trees, shrubs, flower beds, or other items to mow around, then the push mower should have high rear wheels and front caster wheels. The engine torque – which is measured in foot-pounds (ft-lbs), represents the power of the engine. The more power, the faster the blades rotate, which provides better mowing in tall or thick grass. Engine displacement – indicates the size of the engine. It is the amount of water that an object displaces in a container of water. Again, the higher the number the more powerful engine and the better the cutting action. Priming – refers to having to push a button several times to get fuel into the engine to start it. No-prime engines eliminate this step. Cut width – is the width of the area cut in one mowing pass. A blade brake – disengages the blades and stops their rotation but leaves the engine running while you empty the bag. You can adjust the height of the grass cut by using levers by the wheels. Most push lawn mowers require adjusting each wheel separately. However, dual-function or single-lever height adjustment features make this task easier. A deck wash port helps you clean underneath the mower by connecting it to a garden hose. Some mowers offer a bagging system to help you collect clippings. Others offer a mulching option that turns clippings into a fine mulch and spreads it over the yard. If you do not select either of these options, you may have to rake up clippings after you mow. As with choosing between a self-powered or a push mower and push mower features, the choice between gas and electric powered mowers and corded or cordless electric mowers also depends on your yard. Electric mowers are best for yards of less than 1/3 acre. They run cleaner and quieter than gas mowers and start with the flip of a switch. Corded electric mowers will not need to be recharged before the whole yard is mowed. However, the length of the cord and the possibility of getting the cord tangled around obstacles in the yard are issues to consider. Buying a safe and appropriate extension cord for your mower solves the issue of cord length. Cordless push lawn mowers do not have restrictive cords, but they do have restrictions based on the life of the charge and how much of the lawn can be mowed before the battery has to be recharged. Higher voltage lithium ion batteries, such as 40 to 80 volt batteries, provide longer mowing times. Charging times depend on the battery and the charger. Quick-charge batteries can be recharged in 30 minutes while other batteries can take 2 to 3 hours. When buying an electric mower, check the voltage (V) on a cordless mower and the amperage (amps) on a corded mower. The higher the number the more power the mower has. Some electric mowers have a dual-battery system which allows you to switch to the second battery when the first battery is drained. This provides the opportunity to mow the whole yard before the batteries have to be recharged. Also, batteries from other yard equipment, such as string trimmers, hedge trimmers, and blowers, may be compatible with mower batteries. You can interchange the batteries of your cordless lawn care tools, letting one battery charge while using another. 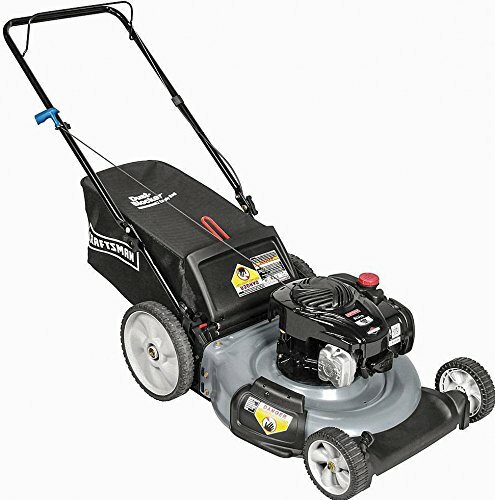 Gas mowers do not have issues with cords or with recharging a battery, but electric mowers do run more cleanly. Gas mowers usually have a crank with a pull start, although some have an electric starter. Be certain you follow the manufacturer’s instructions and use the proper gasoline for your mower. 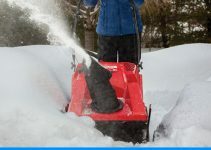 Maintenance required for both gas or electric power mowers include battery care; changing oil, air filters, and spark plugs; and draining excess fuel before putting the mower away for the winter. Reel mowers require more time and effort to mow the yard than push lawn mowers, and mowing has to be done more often to keep grass from getting too high. They are for yards less than 1/3 acre. 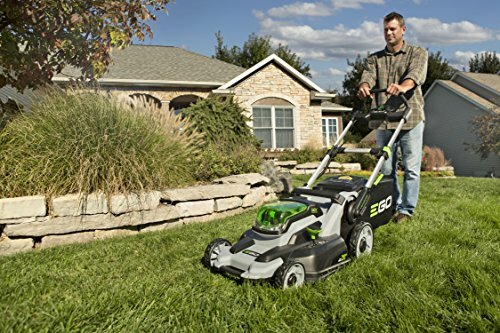 As the push mower is pushed, the reel, which is a set of rotating blades, spins, catching the grass between the rotating blades and a fixed blade. Reel mowers work like scissors and provide a cleaner cut than power mowers. They are also quieter than power mowers, are emission-free, and eliminate some maintenance tasks required for gas and electric mowers. However, sharpening and replacing blades with this type of push mower is more of a chore than with power mowers. 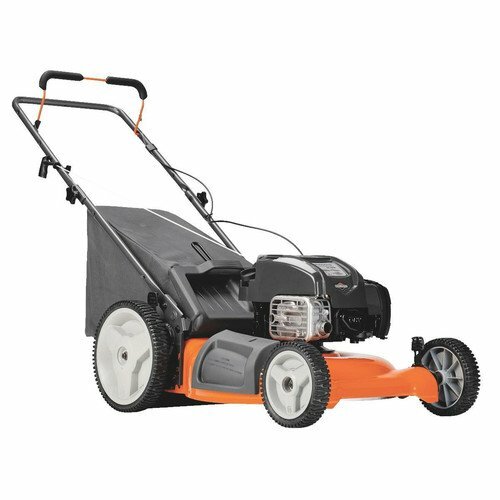 The Poulan Pro Hi-Wheel Push Mower has a 5-ft/lb, 140 cc Briggs and Stratton engine, a 21″ cutting width, mulching, side discharge, and 11″ wheels. This push lawn mower weighs a substantial 61 pounds. A two year limited warranty is provided with this model. The Yard Machines 140cc 20″ Push Mower features a 140cc engine with four cycles and a 20″ cutting width. It has three height adjustments and 7″ front and rear wheels. It is a light 48 pounds. There is a limited one year warranty. 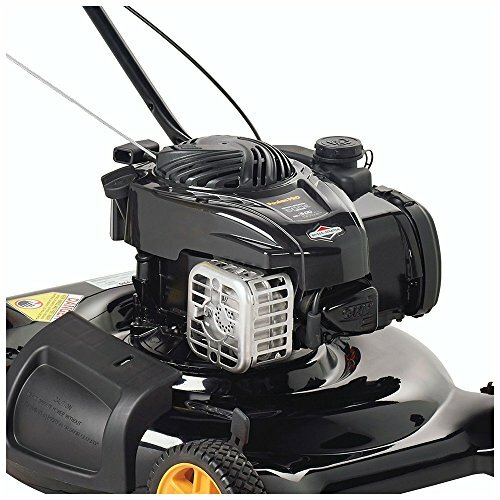 The Craftsman 21″ 140cc Briggs and Stratton Gas Powered 3-in-1 Push Lawn Mower comes with a five-torque, 140cc engine. It has 7″ front wheels, 11″ rear wheels, dual-point height adjustment with six positions, mulching, side discharge, rear bagging, a light recoil starter, and a 21″ cutting width. The Husqvarna 3-In-1 Push Lawn Mower is available with 11″ and 12″ rear wheels with double ball bearings. It features a powerful 160cc Honda engine with easy starting. With a 21″ cutting width, it offers mulching, side discharge, and rear bagging. The soft grip handle folds for easy storage. It has a four-point, six-position height adjustment ranging from 1-1/2″ to 3-1/2″. It weighs 102 pounds. The GreenWorks 12-amp, 24-volt, corded 20″ lawn mower has a 20″ cutting width and enough power to cut the toughest grass. It provides a mulching feature, side discharge, and rear bagging options. The single-lever, seven-position height adjustment ranges from 1-1/2″ to 3-3/4. It has wide, 10″ rear wheels and 7″ front wheels for easy maneuverability. The deck is made of durable steel. It has a collapsible handle and weighs 56 pounds. 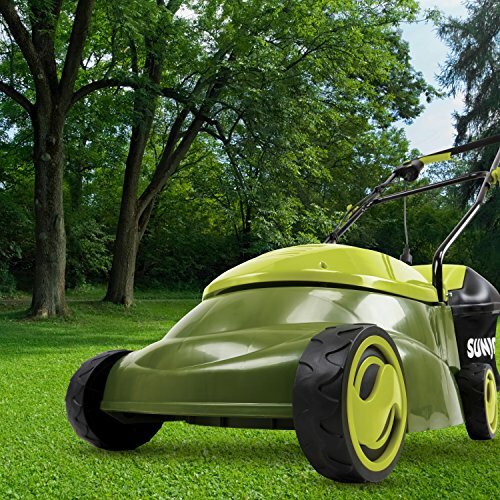 The Sun Joe Mow Joe 14-Inch 12 Amp Electric Lawn Mower With Grass Bag has a cutting width of 14″, push-button start, a safety switch to prevent unintentional starts, a durable steel blade, and a collapsible handle for easy storage. Designed for tight spaces, it is compact and lightweight at 29 pounds. It has a three-position manual height adjustment that ranges from 1.18″ to 2.52″. The grass catcher bag has a capacity of 10.6 gallons. You must buy an extension cord separately. It offers a two year warranty. 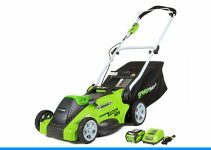 The GreenWorks G-MAX 40V cordless lawn mower with instant electric start is available with a 16″ deck, a 19″ deck, and a 20″ deck. The 16″ deck has a MAX 40-volt 2Ah Li-Ion battery system that powers multiple tools. A 4Ah battery and a charger are included. The 16″ deck features a single-lever, five-position height adjustment ranging from 1-1/4″ to 3-3/8″. It also has a mulching feature, rear bagging, 6″ front wheels, and 7″ rear wheels. It cuts up to 7,000 square feet and has up to a 60 minute run time. The 19″ deck has a MAX 40V Li-Ion Battery System and includes a 4Ah battery, a 2Ah battery, and a charger. These push lawn mowers feature a single-lever, 7-position height adjustment ranging from 1-1/8″ to 3″. It has a mulching feature, rear bagging, side discharge, 10″ rear wheels, and 7″ front wheels. It cuts up to 6,500 square feet and has up to a 45 minute run time. The twin force 20″ deck has the G-MAX 40V Li-Ion Battery System and includes a 4Ah battery, a 2Ah battery, and a charger. This electric mower features Innovative Smart Cut technology that adjusts the power based on the thickness of your grass. 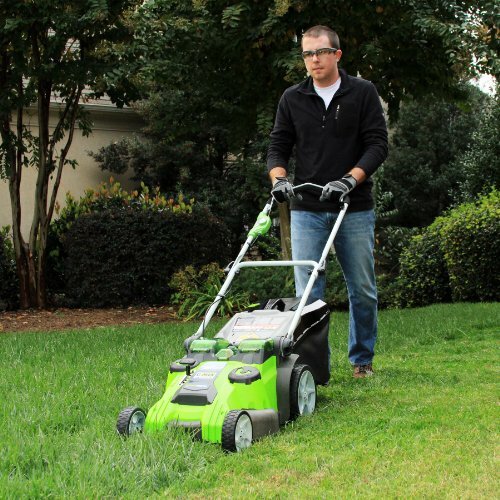 The dual 10″ blades provide a better cut and better mulching, or you can bag the cut grass. It has a single-lever, 5-position height adjustment between 1-1/4″ to 3-1/8″ with 10 inch rear wheels and 7″ front wheels. The automatic battery switchover eliminates downtime when switching to the second battery. It offers up to 70 minutes run time. The 2Ah battery takes 60 minutes to charge and the 4Ah takes 120 minutes to charge. The EGO Power+ 20″’56-Volt Lithium-ion Cordless Lawn Mower comes with 4.0Ah battery and a rapid charger kit. It is also available with a 5.0 Ah battery kit, 7.5 Ah battery kit, and without any battery kit. The 4.0Ah battery provides a 45-minute run time, mows about two miles on a single charge, and has a 30-minute rapid charge time. 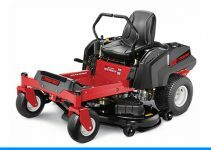 It has a 20″ cut width, LED headlights, 600-watt, high-torque, magnetic motor, push-button start, mulching, side discharge, rear bagging, and folds compactly. These push lawn mowers from EGO Power have a five year warranty. 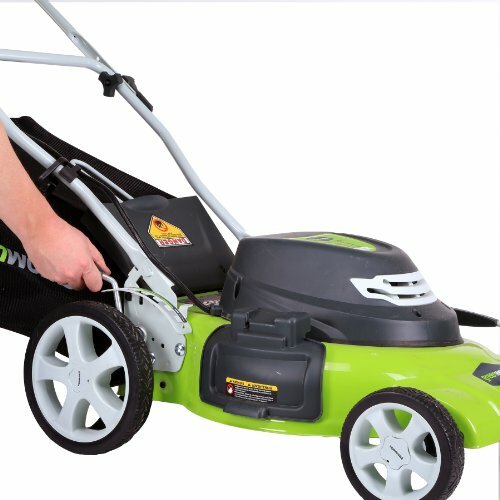 The GreenWorks Reel Lawn Mower with Grass Catcher is available in three cutting widths. The 25052 has a 16″ deck. The 25062 has an 18″ deck, and the 25072 has a 20″ deck and a five blade reel. This GreenWorks Reel Lawn Mower also offers a mulching feature and a rear grass catching bag not offered by other reel push lawn mowers. It has a four position height adjustment that allows you to select a cutting height between 1-1/8″ to 2-1/4″. For maneuverability, it has 10″ front wheels and 2″ rear roller wheels. 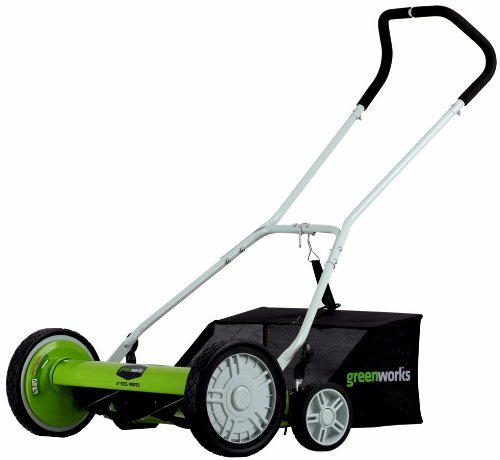 These push lawn mowers from GreenWorks come with a four year warranty. The American Lawn Mower 14″ Push Reel Lawn Mower has a 14″ cutting width and a four blade reel. It has a tempered-alloy steel reel; a three-spider, one-blade reel; a bed knife blade, an adjustable three-section roller; and a zinc-plated handle with plastic grips. 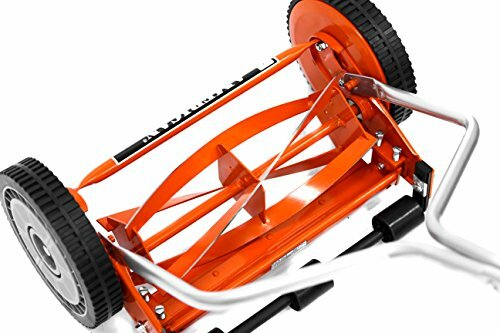 This reel push lawn mower is lightweight, weighing only 19 pounds. The 8 1/2 front wheels are made from high-impact polymer with integral molded tread. The cutting height can adjust from 1/2″ to 1-1/2″. It comes with a limited 90 day warranty. A grass catcher bag is sold separately for this push mower.